Stampingville: Stampin' Up! Online Extravaganza Starts Today! My fun little stamping corner of the world. Stampin' Up! Online Extravaganza Starts Today! Why wait around for Black Friday when you can start saving right now on stamps, ink, paper, and accessories for all your papercrafting projects. The Stampin' Up! Online Extravaganza begins today with up to 40% savings on select products. Some items are only available while supplies last, so shop the sale now for best selection. In addition, there will be 24-hour flash sales on November 21 and 28 offering 20-40% off exclusive bundles and select products. Get a head start on holiday shopping or just grab these hot deals for yourself. All photos, text, and creative designs featured on this blog are © Gayle Wheeler 2010-2018. The artwork and projects featured here are for personal inspiration only and may not be copied for contests or publication. Thank you for your cooperation. Stamped images are © Stampin' Up! This blog is my personal blog and I am responsible for all content. 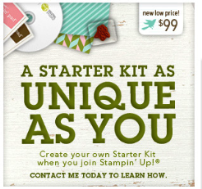 It is not sponsored or endorsed by Stampin' Up! ©2010-2018 All rights reserved. Simple theme. Theme images by dino4. Powered by Blogger.